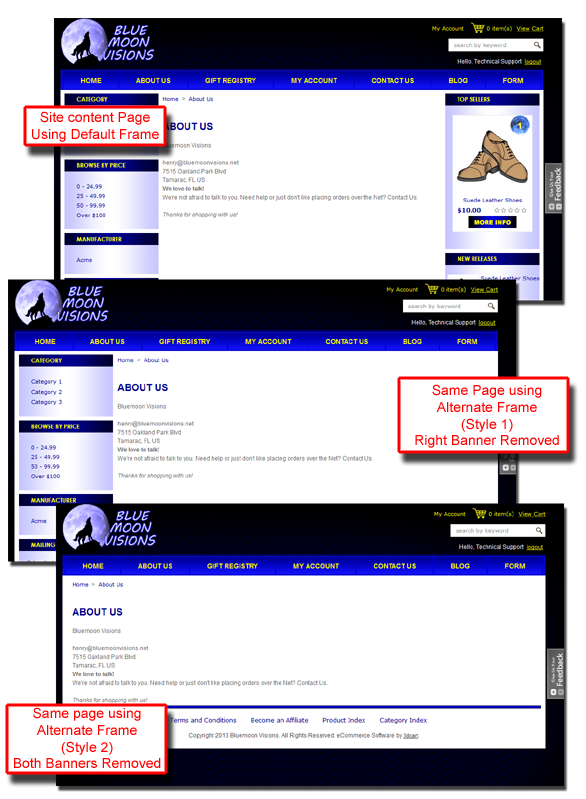 When creating or otherwise editing Extra Pages or Menu Links in your store's "Site Content" area, you may notice that there is a drop down menu labeled "Frame Template." The basic functionality of this drop down menu allows you to assign a customized frame.html template to your extra pages so that they share the same basic look and feel of your main site; while allowing you to remove certain design aspects found in the left or right banners of the store. For example, you may have an extra page on your site in which you'd like to remove or otherwise edit the contents of the right banner (such as the "Top Sellers" and "New Releases") so that it doesn't show up on this page. In this case, you can make your own copy of the default frame.html template which has the right banner content removed altogether. Alternately, you can make an edited frame which removes both the left and right banners as needed. Aside from removing the banners, you can also edit them as needed, just for the specific extra pages so that they appear exactly as you'd like. Download a copy of the theme's respective "frame.html" file. Using your favorite HTML or text editing program, remove or edit the sections you'd like. The above information is being provided solely as a courtesy. Please understand that 3dcart support is neither qualified nor trained to provide HTML editing support. If you are uncomfortable with editing HTML, we also have design services available which can provide this service for you. Please contact our Sales department for more information. Using FTP, upload the newly created file back to your theme folder. Select your alternate Frame file from the drop down. Depending on how the file was named, it will be listed as "Style 1, style 2, etc. The above will only work for "non-linked" Site Content pages. These are pages which you typically create yourself for use on the store like terms and conditions, about us, informational pages, and custom forms. For "linked" pages that are linked to an ASP file like your site's CRM contact Page, Blog, Home Page, Affiliate or My Account pages, you will be able to remove the left and right banners by going to the Content ->Titles & Content area instead.